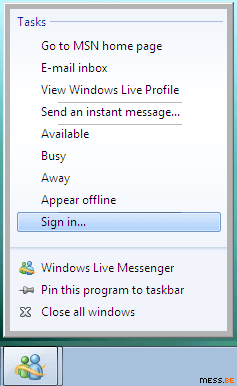 Early adopters among you who've installed the Windows 7 Beta will have noticed the prominent presence of the Windows Live Messenger icon in the taskbar, from which you can send an IM, change your status, etc. But if you prefer its former location, ie. the system tray, all you have to do is exit Windows Live Messenger, right-click its icon (or msnmsgr.exe, usually in C:\Program Files\Windows Live\Messenger), choose Properties, select the Compatibility tab and set the program to run in Windows Vista compatibility mode. An updated Windows Live Messenger client for Symbian S60 5th Edition devices, such as the Nokia 5800 XpressMusic and the upcoming Nokia N97, has leaked via China. Fortunately for those who only know Mandarin as a type of orange, you have the option to switch the application's language to English. The software is expected to become available in the Download! section of the 5800 XpressMusic soon. >> Download Windows Live Messenger for Symbian S60 v5 (v3 also included). Shortly after the connection trouble started on Sunday evening for libpurple-based third party clients, the Pidgin team released version 2.5.4 of their multi-IM client. The update comes with a temporary fix for the Contact server problem, but also takes care of a bug that caused Pidgin to crash when retrieving certain Offline Messages. For a complete changelog, check this link. Kung Fu Panda, the animated comedy by DreamWorks, has been out for about half a year now but I only just discovered the free set of emoticons made available on the movie's official homepage. I've adjusted the 10 emotions of Po, the giant panda, so that they show as big emoticons in Windows Live Messenger. If you're aware of any other emoticons, display pictures, etc. that are being offered for free as part of a marketing campaign for a movie, game or what have you, let us know! >> Collect all ten Kung Fu Panda emoticons. "We actually just reached an all-time high of 460 million." "As you know, we currently have interoperability with Yahoo! Users. We have been working hard on having the average users services all centralized. So, it is a possibility and we are working on it." "That is a feature that we are still working on. As you know, we do hundreds of surveys and questionnaires on a monthly basis. We strive to give users the best possible client." RebelSean notes that Ryan then proceeded to demonstrate how the jump lists features of Windows 7 can be used to navigate through conversations, making them a worthy alternative for tabbed conversations. "We're always going through beta cycles, and now that we've officially launched Wave 3 to the global market, we've already started planning the next wave. No specific date as of yet, but it will be within the next few months." >> Read Exclusive: Interview with Windows Live Directors at Neowin for the full Q&A. Since last night, third party IM clients that use the latest version of libpurple -such as Pidgin and Adium- have been unable to log into the Messenger network. The MSN Protocol version 15 (MSNP15) now appears to require a certificate to retrieve a user's address book, which these third party clients can't provide. Pidgin users should exit the software, install msn-pecan, restart Pidgin and switch to this alternative MSN protocol in your Messenger account settings. UPDATE: Another solution (thanks pidginuser!) is downgrading to version 2.4.3 (Windows). Adium users are recommended to downgrade to Adium 1.3.1 (direct download). Not claiming this was an intentional move to boost installs of their in-house Mac client, but what Microsoft would probably want affected users to do is to download and install Messenger for Mac 7.0.1. "As of 11:43 today (the 12th), MSN is now working for us in 1.3.2. Looks like the Libpurple team was right—it was a server-side problem, which Microsoft has now cleared up. Thank you for your patience." Belgian mobile operator Proximus is offering a free pack of animated emoticons to promote their mobile IM client. An odd choice because -like probably all Java IM clients- Proximus Instant Messaging does not support animated emoticons. Worse still, the ads promoting their client make you believe it does. But hey, we never say no to 12 free and animated emoticons for our PC client, especially if they remind of retro videogames and pixel art. >> Download Proximus Emoticons (Dutch installer) or Proximus Emoticons (French installer). NOTE: Uncheck the two options on the second screen of the installer to avoid changes to your browser settings. >> Watch Proximus Instant Messenger ad #1 and ad #2 (both Flash and Dutch). As previously announced, Patchou updated the Messenger Plus! Live Beta to work with the now compulsory Windows Live Messenger 2009 version released halfway December. You can find the complete changelog over here. The final Messenger Plus! Live 4.80 release is coming before the end of the month. More changes and new bits will be announced then. >> Download Messenger Plus! Live 4.79.353 Beta.